This is a particularly dull week. Much more to come soon. 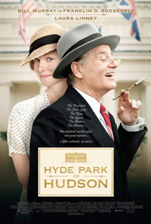 Hyde Park on Hudson (mixed bag): This snapshot from FDR’s life features a Golden Globe-nominated interpretation by Bill Murray, but it is most worthwhile for the British focus it has, featuring Samuel West and Olivia Colman as entertaining versions of the King and Queen of England, equally compelling to those offered by other actors in “The King’s Speech” in a less focused and competent film.